“I admire your strength,” Corporal John McBurney (a devilishly manipulative Colin Farrell) remarks to the headmistress while under the watchful care of the women and girls of the Farnsworth Seminary for ladies, a bastion of secluded tranquility hiding roiling pent-up emotions during the Civil War. He is an injured Union soldier (or perhaps an AWOL mercenary?) discovered in the woods by the nature-loving Amy (Oona Laurence…a stand-in perhaps for director Sofia Coppola?). They are self-sufficient well-bread Southern Belles shielded from the horrors of war, but full of fanciful imaginings and longing. “I’m just trying to give them what they need to survive in these times,” Martha Farnsworth (a masterful modicum of repressed anxiety underneath a gauze of stern maternal stoicism as played by Nicole Kidman) replies. Like Melville’s great white whale or the dogs in Amores Perros, the orcas and puppies in Rust and Bone (De Rouille et D’os) are meant to be symbolic. Here in Jacques Audiard’s audacious new film they represent the unpredictable id of nature and the strained relationships of the ego-driven humans who interact with them. Brilliantly, all is foreshadowed in the opening credits shot like a dream…or is it a nightmare? But there’s a constant movement and a focus on legs with somewhere to go. Life is fluid and on the move. We are all travelers in this drama. Alain (Matthias Schoenaerts, in another physically demanding performance following last year’s Bullhead) is a Belgian man living on the fringe with his five-year old son, Sam (Armand Verdure), and who eventually hitchhikes his way to Antibes where his sister Anna (Corinne Masiero) takes them in. There Alain finds random security gigs while plotting a return to underground fighting. One of his gigs is at a nightclub where he first meets Stephanie (Marion Cotillard, a revelation), an orca trainer at a local resort starving for real human connection. What choice did little Sarah have in a world gone mad? It’s tempting to look at old pictures and imagine the history and stories of the people in them. It’s a way to reach into the past. It’s a way to invoke nostalgia. It’s a way to uncover secrets. It’s become a growing trend amongst Holocaust scholars to move away from the almost unfathomable statistics and instead focus on the faces…the pictures…the singular stories…the individuals. Nowhere is this more apparent than in Manhattan’s equally magnificent and somber Museum of Jewish Heritage, where an entire wing is dedicated to the display of thousands of family photographs that give the horrors of war a back story and a face. Would you like some coffee with your civil war? Claire Denis is one of the most renowned and prolific female directors in world cinema, but her films are known by few outside of urbane critics and religious patrons of the art houses. Her surprisingly heartfelt slice-of-life piece about multiethnic Parisians, 35 Shots of Rum, probably would’ve made my top ten list last year had I seen it in time and is a film that deserved a wider audience. Her latest, the frustratingly non-humanist White Material, isn’t about to win over any new fans or stir up any kind of decent business. But it will have plenty of people talking. In an unnamed African country, civil war has broken out. 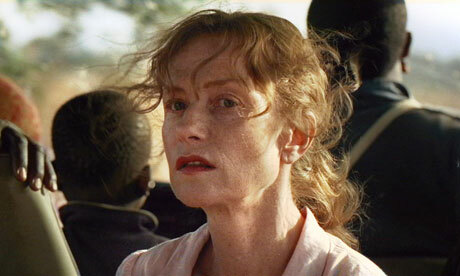 Isabelle Huppert plays Marie, a French woman who runs a coffee plantation and refuses to leave amidst the anarchy and danger, even after French soldiers beg her and her family to evacuate and all of her laborers abandon their work to flee. Determined to bring the latest crop in, she hires a weary group of day laborers while her family falls apart and a notorious rebel leader, wounded and hunted, finds refuge in her home. Sometimes a film exists beyond words (spoken or not) and there’s no description that can accurately prepare one for what they are about to see. 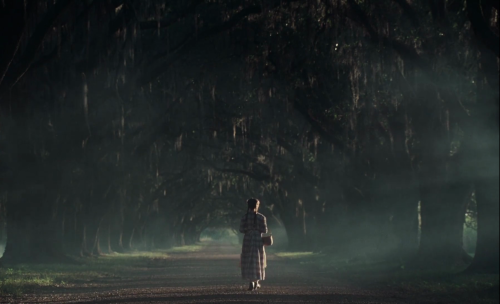 Some films exist solely on a visual level, are so purely cinematic, that nothing anyone could ever say about them could speak as well as the images from the film themselves. Hell, but that won’t stop film buffs and writers like myself from giving it the old college try. Recently, I was lucky enough to have someone over there at the incomparable Wonders in the Dark toss me a copy across the pond of the Kevin Brownlow restored version of Abel Gance’s Napoleon. It included the Thames Television cut of the film (which runs over five hours and is presented mini-series style in three parts) with both the TV tailored single frame version of the Italian set finale and the phantasmagoric tripped-out red-white-and-blue triptych that is unlike anything ever seen before or since. I’ve been told this is the definitive way to view the film and far superior to the Coppola produced version that came out stateside around the same time in 1980.